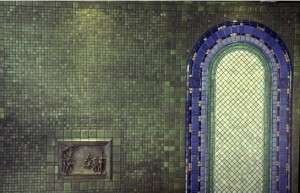 A profoundly rich green hue emanates from luminous arches, which are surrounded by Pewabic tiles that had been originally fired for the Stroh Brewery in 1955. The mural is interspersed with tiles depicting Detroit workers, which were originally installed in Detroit’s Northern High School in 1926. The bronze plaque of Madame Cadillac entering Detroit after her canoe journey from Quebec is by Carlos Romanelli, dated 1903. It is on loan from the Detroit Institute of Arts. All of the green tiles you see were actually made in 1935 by Mary Chase Stratton at Pewabic Pottery. The green tiles were commissioned by the Stroh family for a new brewery that eventually was never built. The tiles were put in storage until 1985 when Peter Stroh donated them for use in the Art in the Stations project. All of the tiles inside of the archways are new tiles. However, the artist made these new tiles from historic molds that were made in 1926. In fact, the original workers tiles made from these molds were installed in Northern High School back in 1929. Another historic aspect of this station is the bronze plaque depicting Madame Cadillac arriving in Detroit after her canoe journey from Quebec. The significance of this piece is that it wasn’t until after women arrived at trading posts that they became settlements. So this depicts the moment Detroit became a city. This plaque was originally made in 1902 and is presently on loan from the Detroit Institute of Arts. Funded By: The Kroger Foundation.